Yesterday I typed a crazy long post about Valentine S'mores. Half of it was me ranting about the best way to get your graham crackers into the shape of a heart. 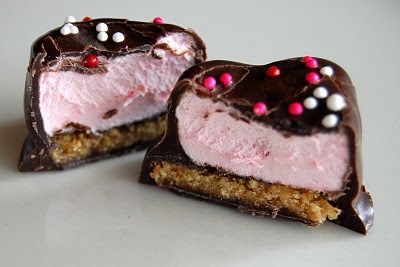 I should have waited for 24 hours for Crazy Domestic to post about her Valentine S'more Bites. These cute heart shaped s'more bites have a perfect heart shaped graham cracker base. How did she do it? She made a graham cracker crust (graham crackers and melted butter) and then cut it out with a cookie cutter. Graham cracker crust! Easy to cut and extra yummy because of the butter. You can see the tutorial for these s'more bites over at Crazy Domestic. 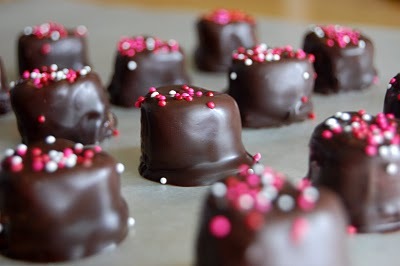 I am making these suckers ASAP! Oh, my goodness. My guys LOVE s'mores. . . but then, who doesn't? And I could get away with making them all cute and heart-shaped since it's a holiday and all. Adorable! By the way, am I the only one who likes to eat graham cracker crust mix? I mean, while it's still in the bowl, before it's baked? I think I could live off that stuff. Richella, you are not alone! Have you ever had Ben and Jerry's Strawberry cheesecake ice cream? The only reason I love it is because it has a graham cracker crust swirl. I wish they would make graham cracker crust swirl ice cream! Thanks for the feature Lorie! I had the same idea (making homemade graham crackers), but thought I'd try this first. Luckily it worked! I still ended up making homemade graham crackers just for fun, but now I'm on the hunt for a GREAT recipe, the one I tried was ho-hum. Oh great! I guess I should have waited a few more hours. I made strawberry flavored marshmallows last night and I am in the middle of making the homemade graham crackers. If they don't work I'm going to try this way next. If they work I will be posting the results on www.joyofjello.com, if your interested, it might take a couple of days though. omg! mind blowing! delicious and cute!